National Party Leader Simon Bridges has welcomed the Prime Minister’s forced backdown on her regional fuel taxes, and called on her to overturn her excise increases and remove the regional fuel tax imposed on Aucklanders. “After pressure from the National Party over her Government’s decision to impose more and more new taxes on record petrol prices the Prime Minister has today finally backed down and ruled out rolling the regional fuel tax out beyond Auckland while she is Prime Minister. 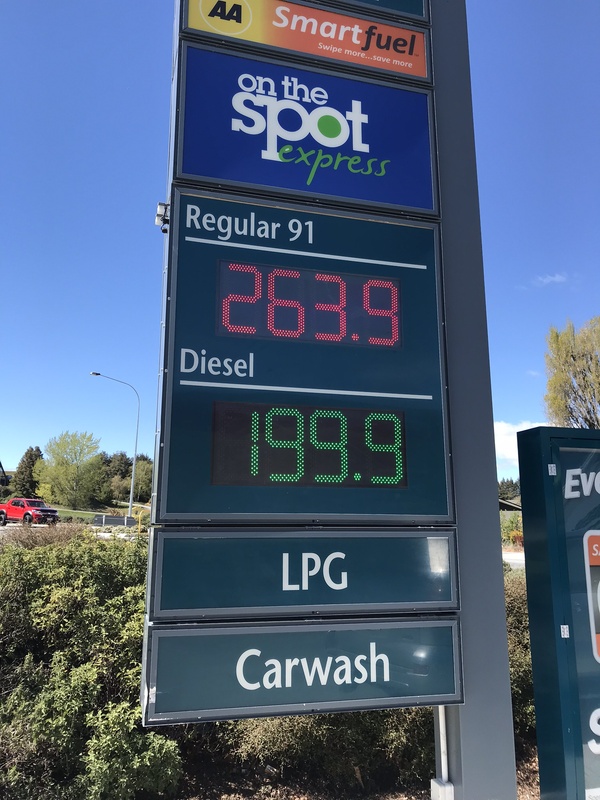 “This is in spite of her Government introducing legislation which would have enabled the 11.5 cent per litre regional fuel tax to be rolled out around the country from 2021. It has already been imposed on Aucklanders. “Fourteen other councils had already started discussions with the Government saying they wanted the tax and will be surprised to hear about the Prime Minister’s backdown today. “Her Transport Minister was also be surprised at his Prime Minister’s unilateral decision. This was forced policy made up on the hoof by a Prime Minister under pressure over her disregard for the costs her Government is imposing on New Zealanders. Policy on the hoof is becoming a habit. This time it’s doing the right thing but it’s not a good way to govern. “New Zealanders will be relieved. These taxes on top of record petrol prices are hitting them hard and pricing them out of their cars yet this Government was blindly forging ahead with new taxes because it can’t get its spending under control. She can cast blame on fuel companies but nearly half the cost of a litre of petrol is tax. It was bad enough when all the money collected was spent on roads, it’s much worse now some is being spent on cycleways and public transport most of us will never use. Jacinda Ardern reckons fuel companies are fleecing us.
. . . MTA Chief Executive Craig Pomare says the biggest influences on prices at the pump are the landed refined price of petrol and diesel, taxes and the value of the NZ dollar against the USA dollar. He says if the Government is seriously concerned, there is plenty of precedent for reviewing fuel taxes and either lowering them, or holding off on further increases. The tipping point for fuel consumers has been the blunt and ineffective fuel taxes imposed by local and central government. The margins identified by media today are less than most retailers would seek and have not changed. Consumers don’t only find the price unacceptable, Many also find it unaffordable. The National Party has called for the tax increases to be dropped. The government that is taking nearly half the price of fuel in tax and worsening the pain by spending the increases not on roads but public transport and cycle ways most of us will never use. Petrol in Palmerston North on Tuesday cost $2.11 a litre. In Kurow on Wednesday it was $2.30. That’s hard to stomach when the four-lane highway that was planned for the very busy Christchurch to Ashburton section of State Highway 1 has been canned. A little bit of the extra we’re paying is a result of higher prices for crude oil and the lower New Zealand dollar. A lot of it is tax. We’re paying more and getting less. Transport Minister Phil Twyford says the poor will pay less fuel tax than wealthier people. “Transport Minister Phil Twyford is either very brave or very stupid in arguing that fuel taxes are easiest on the poor,” says Taxpayers’ Union spokesman Louis Houlbrooke. Let’s not forget it’s not just the direct cost that will hit the poorest hardest. Every service and all goods with a transport component (and can you think of anything that doesn’t have one?) will be impacted by the tax and that will, sooner or later, lead to price increases, inflationary pressure and interest rate rises. The Ardern/Peters/Shaw/Davidson coalition government, all parties in which purport to represent and work for the poor, is adding to the cost of living and making life harder for them. And adding to that is yesterday’s announcement we’ll all be paying an extra 10.5 cents a litre over the next two years in excise tax. Michael Redell writes on regressivity, petrol taxes, and ministerial PR at Croaking Cassandra. Thomas Lumley examines the issue at Stats Chat. Sam Warburton tweets on it here. How much more will you pay for food? The fuel tax legislation the government has just passed to allow Auckland Council to compensate for the mayor Phil Goff’s inability to rein in costs will hit us all. “This fuel tax will hit the poorest hardest, especially those who live in outer suburbs and drive older vehicles.” . . It won’t just hit Aucklanders, it will hit us all because it will add to the cost of transport on all goods and every service. Confusion reigns after Labour passed its Regional Fuel Tax (RFT) law yesterday, says Horticulture New Zealand chief executive Mike Chapman. “This tax comes into force in Auckland on Sunday, yet there is no system in place for off-road ‘behind the farm gate’ vehicles and machinery used by the 441 fruit and vegetable growers in Auckland that we represent,” Chapman says. “Growers should not have to pay the RFT for vehicles and machinery that are supposed to be excluded from this tax, yet on Sunday they will have to. We are talking about considerable numbers of vehicles and machinery used to produce healthy food for New Zealanders, both in Auckland and beyond. “Having paid this tax that doesn’t apply to off-road use, because there is no exemption process, they will then have to go through a complicated and costly process to get a rebate on that tax. This is just not logical. The Government has spent seven figures developing a rebate system without ever talking to future users, or considering that they shouldn’t have to pay the tax in the first place. “It makes no sense, nor is it fair, that this money will sit in a government bank account earning interest for at least three months, when it has been unreasonably collected before possibly being eligible for rebate. This tax is designed to improve Auckland’s transport system, and therefore must exclude vehicles not used on those roads. Food production also uses a lot of diesel-fuelled machinery that gets captured by this tax unnecessarily. It’s not just fruit and vegetable growers that will be hit. All farmers and fishers in the Auckland region will be hit by this and cost increases will spread beyond the region and that will inevitably lead to increases in the price of all food – fruit, vegetables, nuts, grains, fish, poultry, eggs, bacon, ham, pork, beef, lamb and milk. “This process has been so rushed to meet Auckland Mayor Phil Goff’s announced 1 July deadline, that we feel that we have not been listened to and the full democratic process has been unnecessarily truncated – to the point Labour suggested the committee stage of the Bill did not even need to be debated, in the interests of time. “This will affect growers’ businesses and costs considerably, to the point of hundreds of thousands of dollars a year. Those costs will be passed on to consumers, making healthy food more expensive at a time when many households are already struggling. “That’s why we thoroughly endorse what the Minister said during the second stage when the House considered this bill. He is bringing forward, in short order, a body of work that will enable the inefficiencies and the areas that have to be refined in terms of a broad rebate system. It will deal not only to the challenges of implementing this particular impost, but also the entirety of the country. So I say to the potato-growers, onion-growers, not only will I look forward to defending your elite soils, destroyed by Nick Smith under the last regime, but there will be an efficient process to ensure that people who feel that too much of the fuel that they’re purchasing with this impost they cannot claim back through a robust rebate system. So the bill does deal with that, and the Minister is going to go on to make further announcements.” – From Hansard. “This will not happen by Sunday,” Chapman says. “We are very disappointed in this process. We can only hope that the ‘inefficiencies and the areas that have to be refined in terms of a broad rebate system’ will be dealt with using the same speed that was used to force this ill-conceived Bill into law. Fine words don’t feed families and this tax, rushed through parliament will make it harder still for those already struggling to put healthy food on their tables. The government is crowing about the help it’s giving with its Families Package and winter fuel payment but that will be no compensation for the increased costs of everything because of the fuel tax. Increased costs will fuel inflation which in turn will put pressure on interest rates which will put more pressure on prices . . . The fuel tax will fuel a vicious cycle of cost increases which will hit the poor hardest, all because Goff and his council can’t control their spending.